The human circulatory system feeds and nourishes every other system in the body. Partial failure of this system affects the whole body, in particular the brain which controls every function of the body, so the effect is both direct and indirect. High blood pressure, or hypertension, is usually associated with ageing, but today more and more Irish people aged 40-60 are suffering from it. There are many causes of high blood pressure or hypertension. The heart is like a pump and the arteries are like a hosepipe. If the pump functions more effectively, the pressure of fluid i.e. the blood, increases. Primary hypertension can grow into secondary or permanent hypertension if not controlled properly. Hormonal. Steroids to treat physical conditions. Stage 2 : The blood pressure is continuously raised and medication is essential to bring it down to normal. How do know if I have high blood pressure? 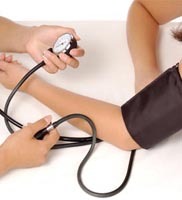 There are few if any outward symptoms that indicate that you have high blood pressure. The only way you can find out if you have high blood pressure is by having it checked. What are the dangers of high blood? High blood pressure causes hidden damage to your blood vessels and heart. If hypertension is left undiagnosed and untreated this damage progresses over time and can lead to a stroke or heart attack. These occur at a younger age in people with high blood pressure than in people with normal blood pressure. Yes. If high blood pressure is detected early it can brought down to normal levels thereby reducing the damage to the cardiovascular system, and it may even be reversed. Therefore possible strokes and heart attacks can be prevented, or at the very least, postponed. Hypertension is measured with an implement called a sphygmomanometer. Traditional sphygmomanometers have a cuff that is wrapped around your biceps / upper arm. This is then inflated to a certain pressure with a hand pump. The pressure is read in millimetres of mercury read on a glass column. As the pressure is released, sounds may be heard with a stethoscope placed over an artery on the front of the arm - the brachial artery; this is the pressure when the heart contracts. This the systolic blood pressure. When the sounds disappear, the lowest pressure when the heart is relaxing is reached. This is the diastolic blood pressure. Modern sphygmomanometers no longer contain mercury. These modern machines use microphones to hear the sounds disappear or an oscilloscope which senses motion from the occluded artery in order to record the blood pressure. There is a move away from relying on casual or one-off blood pressure measurements such as on your first visit to your GP. Quite often high blood pressure readings taken under such circumstances may be due to anxiety associated with the visit to the GP. This is often referred to as 'white coat hypertension'. For this reason your doctor may wish to measure your blood pressure on several of occasions and he/she may decide to have record your blood pressure over a 24 hour period before deciding to prescribe treatment. Does salt contribute to high blood pressure? Evidence is growing that suggests that salt is an contributory factor in causing high blood pressure. Our intake of salt and cholesterol is too high. Avoid adding salt to your food and check the salt content of the foods you buy. Does being overweight contribute to high blood pressure? Overweight or obese people have higher blood pressure levels than thin people and reducing weight helps to bring your blood pressure down. For overweight people it becomes more difficult to measure blood pressure accurately because of the increased arm circumference. This may result in the underestimation of your blood pressure.